Wine making : The ripeness of the grapes is strictly monitored by our oenologists, the grapes are hand picked in small cases. The hole grapes are placed in temperature controlled stainless steel tanks and a traditional fermentation began for about 30 days. The malolactic fermentation finalize the smooth taste of the wine. 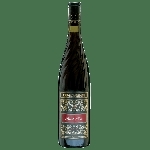 Tasting Notes : Deep and inky red color, the wine has a complex aroma of dark red fruits,hint of black chocolate, well balanced body and pleasant finish.